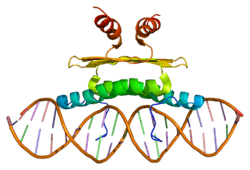 Myocyte-specific enhancer factor 2C also known as MADS box transcription enhancer factor 2, polypeptide C is a protein that in humans is encoded by the MEF2C gene. MEF2C is a transcription factor in the Mef2 family. The gene is located at 5q14.3 on the minus (Crick) strand and is 200,723 bases in length. The encoded protein has 473 amino acids with a predicted molecular weight of 51.221 kiloDaltons. Three isoforms have been identified. Several post translational modifications have been identified including phosphorylation on serine-59 and serine-396, sumoylation on lysine-391, acetylation on lysine-4 and proteolytic cleavage. This gene is involved in cardiac morphogenesis and myogenesis and vascular development. It may also be involved in neurogenesis and in the development of cortical architecture. Mice without a functional copy of the Mef2c gene die before birth and have abnormalities in the heart and vascular system. It is one of the targets of an oncomiR, MIRN21. ↑ Leifer D, Krainc D, Yu YT, McDermott J, Breitbart RE, Heng J, Neve RL, Kosofsky B, Nadal-Ginard B, Lipton SA (Feb 1993). "MEF2C, a MADS/MEF2-family transcription factor expressed in a laminar distribution in cerebral cortex". Proceedings of the National Academy of Sciences of the United States of America. 90 (4): 1546–50. doi:10.1073/pnas.90.4.1546. PMC 45911 . PMID 7679508. ↑ McDermott JC, Cardoso MC, Yu YT, Andres V, Leifer D, Krainc D, Lipton SA, Nadal-Ginard B (Apr 1993). "hMEF2C gene encodes skeletal muscle- and brain-specific transcription factors". Molecular and Cellular Biology. 13 (4): 2564–77. doi:10.1128/mcb.13.4.2564. PMC 359588 . PMID 8455629. ↑ Molkentin JD, Black BL, Martin JF, Olson EN (Jun 1996). "Mutational analysis of the DNA binding, dimerization, and transcriptional activation domains of MEF2C". Molecular and Cellular Biology. 16 (6): 2627–36. doi:10.1128/mcb.16.6.2627. PMC 231253 . PMID 8649370. ↑ "Entrez Gene: MEF2C myocyte enhancer factor 2C". ↑ Sartorelli V, Huang J, Hamamori Y, Kedes L (Feb 1997). "Molecular mechanisms of myogenic coactivation by p300: direct interaction with the activation domain of MyoD and with the MADS box of MEF2C". Molecular and Cellular Biology. 17 (2): 1010–26. doi:10.1128/mcb.17.2.1010. PMC 231826 . PMID 9001254. ↑ Wang AH, Bertos NR, Vezmar M, Pelletier N, Crosato M, Heng HH, Th'ng J, Han J, Yang XJ (Nov 1999). "HDAC4, a human histone deacetylase related to yeast HDA1, is a transcriptional corepressor". Molecular and Cellular Biology. 19 (11): 7816–27. doi:10.1128/mcb.19.11.7816. PMC 84849 . PMID 10523670. ↑ Wang AH, Yang XJ (Sep 2001). "Histone deacetylase 4 possesses intrinsic nuclear import and export signals". Molecular and Cellular Biology. 21 (17): 5992–6005. doi:10.1128/MCB.21.17.5992-6005.2001. PMC 87317 . PMID 11486037. ↑ Hosking BM, Wang SC, Chen SL, Penning S, Koopman P, Muscat GE (Sep 2001). "SOX18 directly interacts with MEF2C in endothelial cells". Biochemical and Biophysical Research Communications. 287 (2): 493–500. doi:10.1006/bbrc.2001.5589. PMID 11554755. ↑ Krainc D, Bai G, Okamoto S, Carles M, Kusiak JW, Brent RN, Lipton SA (Oct 1998). "Synergistic activation of the N-methyl-D-aspartate receptor subunit 1 promoter by myocyte enhancer factor 2C and Sp1". The Journal of Biological Chemistry. 273 (40): 26218–24. doi:10.1074/jbc.273.40.26218. PMID 9748305. ↑ Maeda T, Gupta MP, Stewart AF (Jun 2002). "TEF-1 and MEF2 transcription factors interact to regulate muscle-specific promoters". Biochemical and Biophysical Research Communications. 294 (4): 791–7. doi:10.1016/S0006-291X(02)00556-9. PMID 12061776. ↑ Bi W, Drake CJ, Schwarz JJ (Jul 1999). "The transcription factor MEF2C-null mouse exhibits complex vascular malformations and reduced cardiac expression of angiopoietin 1 and VEGF". Developmental Biology. 211 (2): 255–67. doi:10.1006/dbio.1999.9307. PMID 10395786. ↑ Nowakowska BA, Obersztyn E, Szymańska K, Bekiesińska-Figatowska M, Xia Z, Ricks CB, Bocian E, Stockton DW, Szczałuba K, Nawara M, Patel A, Scott DA, Cheung SW, Bohan TP, Stankiewicz P (Jul 2010). "Severe mental retardation, seizures, and hypotonia due to deletions of MEF2C". American Journal of Medical Genetics Part B. 153B (5): 1042–51. doi:10.1002/ajmg.b.31071. PMID 20333642. Leifer D, Krainc D, Yu YT, McDermott J, Breitbart RE, Heng J, Neve RL, Kosofsky B, Nadal-Ginard B, Lipton SA (Feb 1993). "MEF2C, a MADS/MEF2-family transcription factor expressed in a laminar distribution in cerebral cortex". Proceedings of the National Academy of Sciences of the United States of America. 90 (4): 1546–50. doi:10.1073/pnas.90.4.1546. PMC 45911 . PMID 7679508. Krainc D, Haas M, Ward DC, Lipton SA, Bruns G, Leifer D (Oct 1995). "Assignment of human myocyte-specific enhancer binding factor 2C (hMEF2C) to human chromosome 5q14 and evidence that MEF2C is evolutionarily conserved". Genomics. 29 (3): 809–11. doi:10.1006/geno.1995.9927. PMID 8575784. Molkentin JD, Li L, Olson EN (Jul 1996). "Phosphorylation of the MADS-Box transcription factor MEF2C enhances its DNA binding activity". The Journal of Biological Chemistry. 271 (29): 17199–204. doi:10.1074/jbc.271.29.17199. PMID 8663403. Black BL, Ligon KL, Zhang Y, Olson EN (Oct 1996). "Cooperative transcriptional activation by the neurogenic basic helix-loop-helix protein MASH1 and members of the myocyte enhancer factor-2 (MEF2) family". The Journal of Biological Chemistry. 271 (43): 26659–63. doi:10.1074/jbc.271.43.26659. PMID 8900141. Gradwohl G, Fode C, Guillemot F (Nov 1996). "Restricted expression of a novel murine atonal-related bHLH protein in undifferentiated neural precursors". Developmental Biology. 180 (1): 227–41. doi:10.1006/dbio.1996.0297. PMID 8948587. Sartorelli V, Huang J, Hamamori Y, Kedes L (Feb 1997). "Molecular mechanisms of myogenic coactivation by p300: direct interaction with the activation domain of MyoD and with the MADS box of MEF2C". Molecular and Cellular Biology. 17 (2): 1010–26. doi:10.1128/mcb.17.2.1010. PMC 231826 . PMID 9001254. Han J, Jiang Y, Li Z, Kravchenko VV, Ulevitch RJ (Mar 1997). "Activation of the transcription factor MEF2C by the MAP kinase p38 in inflammation". Nature. 386 (6622): 296–9. doi:10.1038/386296a0. PMID 9069290. Kato Y, Kravchenko VV, Tapping RI, Han J, Ulevitch RJ, Lee JD (Dec 1997). "BMK1/ERK5 regulates serum-induced early gene expression through transcription factor MEF2C". The EMBO Journal. 16 (23): 7054–66. doi:10.1093/emboj/16.23.7054. PMC 1170308 . PMID 9384584. Krainc D, Bai G, Okamoto S, Carles M, Kusiak JW, Brent RN, Lipton SA (Oct 1998). "Synergistic activation of the N-methyl-D-aspartate receptor subunit 1 promoter by myocyte enhancer factor 2C and Sp1". The Journal of Biological Chemistry. 273 (40): 26218–24. doi:10.1074/jbc.273.40.26218. PMID 9748305. Swanson BJ, Jäck HM, Lyons GE (Jun 1998). "Characterization of myocyte enhancer factor 2 (MEF2) expression in B and T cells: MEF2C is a B cell-restricted transcription factor in lymphocytes". Molecular Immunology. 35 (8): 445–58. doi:10.1016/S0161-5890(98)00058-3. PMID 9798649. Wilson-Rawls J, Molkentin JD, Black BL, Olson EN (Apr 1999). "Activated notch inhibits myogenic activity of the MADS-Box transcription factor myocyte enhancer factor 2C". Molecular and Cellular Biology. 19 (4): 2853–62. doi:10.1128/mcb.19.4.2853. PMC 84078 . PMID 10082551. Yang SH, Galanis A, Sharrocks AD (Jun 1999). "Targeting of p38 mitogen-activated protein kinases to MEF2 transcription factors". Molecular and Cellular Biology. 19 (6): 4028–38. doi:10.1128/mcb.19.6.4028. PMC 104362 . PMID 10330143. Morin S, Charron F, Robitaille L, Nemer M (May 2000). "GATA-dependent recruitment of MEF2 proteins to target promoters". The EMBO Journal. 19 (9): 2046–55. doi:10.1093/emboj/19.9.2046. PMC 305697 . PMID 10790371. Wu Z, Woodring PJ, Bhakta KS, Tamura K, Wen F, Feramisco JR, Karin M, Wang JY, Puri PL (Jun 2000). "p38 and extracellular signal-regulated kinases regulate the myogenic program at multiple steps". Molecular and Cellular Biology. 20 (11): 3951–64. doi:10.1128/MCB.20.11.3951-3964.2000. PMC 85749 . PMID 10805738.